For other uses, see Catch and release (disambiguation). 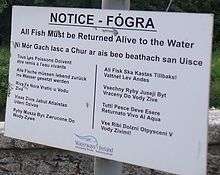 Multilingual catch and release sign in Ireland. In the United States, catch and release was first introduced as a management tool in the state of Michigan in 1952 as an effort to reduce the cost of stocking hatchery-raised trout. Anglers fishing for fun rather than for food accepted the idea of releasing the fish while fishing in so-called "no-kill" zones. Conservationists have advocated catch and release as a way to ensure sustainability and to avoid overfishing of fish stocks. Lee Wulff, a New York-based fly angler, author and film maker, promoted catch and release as early as 1936 with the phrase "Game fish are too valuable to be caught only once." Don Martinez a West Yellowstone, Montana fly shop owner promoted catch and release in his 1930-40s newsletters sent to Eastern anglers. In Australia, catch and release caught on slowly, with some pioneers practicing it in the 1960s, and the practice slowly became more widespread in the 1970s and 1980s. Catch and release is now widely used to conserve — and indeed is critical in conserving — vulnerable fish species like the large, long lived native freshwater Murray Cod and the prized, slowly growing, heavily fished Australian bass, heavily fished coastal species like Dusky Flathead and prized gamefish like striped marlin. In the Republic of Ireland, catch and release has been used as a conservation tool for atlantic salmon and sea trout fisheries since 2003. A number of fisheries now have mandatory catch and release regulations. Catch and release for coarse fish has been used by sport anglers for as long as these species have been fished for on this island. However catch and release for Atlantic salmon has required a huge turn about in how many anglers viewed the salmon angling resource. To encourage anglers to practice catch and release in all fisheries a number of Government led incentives have been implemented. In Canada, catch and release is mandatory for some species. Canada also requires, in some cases, the use of barbless hooks to facilitate release and minimize injury. In Switzerland and Germany, catch and release fishing is considered inhumane and is now banned. In Germany, the Animal Welfare Act states that "no-one may cause an animal pain, suffering or harm without good reason". This leaves no legal basis for catch and release due to its argued inherent lack of "good reason", and thus personal fishing is solely allowed for immediate food consumption. Additionally, it is against the law to release fish back into the water if they are above minimum size requirements and aren't a protected species or in closed season. In 2011, the National Park Service in Yellowstone National Park began reversing decades of regulation that promoted catch and release and other techniques that protected fish populations. In the name of native fish conservation, they began mandatory kill regulations on rainbow and brook trout in the Lamar River drainage and encouraged unlimited taking and disposal of non-native species, including brown trout in some park waters. Over the last few decades there has been an emphasis on the development and refinement of science-based practices to increase the likelihood that released fish will survive (e.g. See research by Steven J. Cooke). That work led to the development of the UN FAO Technical Guidelines for Recreational Fisheries . Effective catch and release fishing techniques avoid excessive fish fighting and handling times, avoid damage to fish skin, scale and slime layers by nets, dry hands and dry surfaces (that leave fish vulnerable to fungal skin infections), and avoid damage to throat ligaments and gills by poor handling techniques. It is also important to use a type of net that is not abrasive to the fish (such as a rubber coated net or lightweight mesh), because fish can easily damage themselves in a hard plastic-style net while thrashing. The use of barbless hooks is an important aspect of catch and release; barbless hooks reduce injury and handling time, increasing survival. Frequently, fish caught on barbless hooks can be released without being removed from the water, and the hook(s) effortlessly slipped out with a single flick of the pliers or leader. Barbless hooks can be purchased from several major manufacturers or can be created from a standard hook by crushing the barb(s) flat with needle-nosed pliers. Some anglers avoid barbless hooks because of the erroneous belief that too many fish will escape. Concentrating on keeping the line tight at all times while fighting fish, equipping lures that do not have them with split rings, and using recurved point or "Triple Grip" style hooks on lures, will keep catch rates with barbless hooks as high as those achieved with barbed hooks. One study looking at brook trout found that barbless hooks did not result in statistically significantly lower mortality rates than barbed hooks when fish were hooked in the mouth, but did elevate mortalities if fish were hooked deeper. The study also suggested bait fishing does not have a significantly higher mortality when utilized in an active style, rather than a passive manner that allows the fish to swallow the bait. To make a hook barbless, the barb is simply crushed flat with a pair of needle-nosed pliers, a trivial task. Medium grit sandpaper can be further used to ensure complete removal of the barb, but this is not necessary and is rarely done. The effects of catch and release vary from species to species. A study of fish caught in shallow water on the Great Barrier Reef showed high survival rates (97%+) (e.g.) for released fish if handled correctly and particularly if caught on artificial baits such as lures. Fish caught on lures are usually hooked cleanly in the mouth, minimizing injury and aiding release. 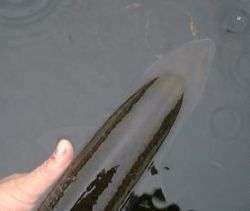 Other studies have shown somewhat lower survival rates for fish gut-hooked on bait if the line is cut and the fish is released without trying to remove the hook. Catch & Release angling area on the Stura di Lanzo (Italy). Catch and release is a conservation practice developed to prevent overharvest of fish stocks in the face of growing human populations, mounting fishing pressure, increasingly effective fishing tackle and techniques, inadequate fishing regulations and enforcement, and habitat degradation. Sports fishers have been practicing catch and release for decades, including with some highly pressured fish species. Proponents of catch and release dispute the suggestion that fish hooked in the mouth feel pain. Opponents of catch and release point out that fish are highly evolved vertebrates that share many of the same neurological structures that, in humans, are associated with pain perception. They point to studies that show that, neurologically, fish are quite similar to so-called higher vertebrates and that blood chemistry reveals that hormones and blood metabolites associated with stress are quite high in fish struggling against hook and line. The idea that fish do not feel pain in their mouths has been studied at the University of Edinburgh and the Roslin Institute by injecting bee venom and acetic acid into the lips of rainbow trout; the fish responded by rubbing their lips along the sides and floors of their tanks in an effort to relieve themselves of the sensation. Lead researcher Dr. Lynne Sneddon wrote, "Our research demonstrates nociception and suggests that noxious stimulation in the rainbow trout has adverse behavioral and physiological effects. This fulfils the criteria for animal pain." A recent (2014) paper provides a critique of existing studies that purport to demonstrate that fish feel pain. James D. Rose of the University of Wyoming argues this may demonstrate a chemical sensitivity rather than pain and that the evidence for pain sensation in fish is ambiguous. During an Oklahoma Department of Wildlife Conservation study, up to 43 percent of fish released after being caught died within six days as a result of inadequate holding and weigh in procedures during tournaments. More recent studies reported in Montana estimate that approximately 20% of released trout die from injuries or stress and even those that don't die, their injuries may significantly reduce their ability to feed and grow. While a number of scientific studies have now found shallow water fish caught-and-released on fly and lure have extremely high survival rates (95–97%) and moderately high survival rates on bait (70–90%, depending on species, bait, hook size, etc. ), emerging research suggests catch and release does not work very well with fish caught when deep sea fishing. Most deep sea fish species suffer from the sudden pressure change when wound to the surface from great depths; these species cannot adjust their body's physiology quickly enough to follow the pressure change. The result is called "barotrauma". Fish with barotrauma will have their enormously swollen swim-bladder protruding from their mouth, bulging eyeballs, and often sustain other, more subtle but still very serious injuries. Upon release, fish with barotrauma will be unable to swim or dive due to the swollen swim-bladder. The common practice has been to deflate the swim bladder by pricking it with a thin sharp object before attempting to release the fish. Emerging research indicates both barotrauma and the practice of deflating the swimbladder are both highly damaging to fish, and that survival rates of caught-and-released deep-sea fish are extremely low. However, barotrauma requires that fish be caught at least 30 – 50 feet below the surface. Many surface caught fish, such as billfish, and all fish caught from shore, do not meet this criterion and thus do not suffer barotrauma. ↑ Giudice, Gary. "A Hero of Mine: Remembering Lee Wulff". Outdoor Writers Association of America. Retrieved 2014-11-15. ↑ Grant, George (Spring 1982). "Don Martinez-Western Dry Fly Master" (PDF). American Fly Fisher. American Museum of Fly Fishing. 9 (2): 9–14. Archived from the original (pdf) on 2014-11-29. Retrieved 2014-11-15. 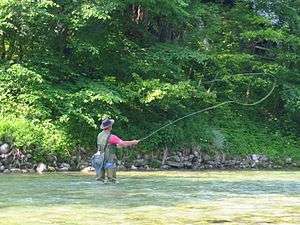 ↑ "Reluctant anglers drafted in war on fish". Fox News. Retrieved January 26, 2016. ↑ "2015 Yellowstone National Park Fishing Regulations" (PDF). National Park Service. Retrieved 2014-04-13. 1 2 Dubois, R. B.; Kuklinski, K. E. (2004). "Effect of Hook Type on Mortality, Trauma, and Capture Efficiency of Wild, Stream-Resident Trout Caught by Active Baitfishing". North American Journal of Fisheries Management. 24 (2): 617. doi:10.1577/M02-172.1. ↑ Drews, Debby (Spring 2016). "Like a Fish Out of Water". 17 (1). Outside Bozeman: 70–74. Retrieved April 17, 2016. ↑ 100% of Jew fish landed from water 15 to 20 meters deep have life-threatening injuries. Official Barotrauma results. Practicing Catch and Release Maryland Department of Natural Resources. Retrieved 9 September 2009. Catch-and-Release Fishing Rhode Island Sea Grant. Retrieved 9 September 2009. Catch And Release Fishing Native Fish Australia. Retrieved 9 September 2009. Catch and release Department of Fish and Game, Alaska. Retrieved 9 September 2009. Only Some Catch And Release Methods Let The Fish Live ScienceDaily, 4 June 2007.